spans grades 5 through 8 and is made up of three levels of band as well as two levels of jazz band. ​Follow the menu links above to learn more about our program. We will have Solo and Ensemble Festival on Saturday, 2/9 in Frankfort. Students have been given their performance times and a list of important reminders. Jazz Ensemble will be receiving a workshop with three clinicians this month, thanks to the support of the D123 Music Boosters! It's time for the annual Roller Skating Party! Potbelly Fundraiser Nov. 14, 4-7 PM! Our Fall Concert is fast approaching! Click here to view the Band Calendar. Solo and Ensemble entry forms are now available. Click here to view the info letter. Click below to view the master Band Calendar for the 2018-19 school year. We will taking the Intermediate Band and Sunrise Singers to a performance by the Southwest Symphony Orchestra on Tuesday, October 23, 2018. Click here to view the permission form. First morning band for 5th grade will be Tuesday, October 2nd. Click here to view the info letter. We are excited for a new school year of learning and music making! We will have an open house meeting on Wednesday, August 29 at 6 p.m. for 6-8 grade band parents in the OLHMS Cafetorium. We will have an open house meeting on Wednesday, September 5 at 6 p.m. for 5th grade band parents in the OLHMS Band Room. Music Booster membership forms now available! Congratulations to the OLHMS Concert Band and Jazz Ensemble on Division 1 ratings at District Contest! Both bands will next move on to perform for State Contest at the end of the month. For more info on Concert Band contest click here. For info on Jazz Ensemble contest click here. We have a number of fun and exciting events happening in the world of the District 123 Band Program! Click here to read an update from our Music Boosters President. Not a member of the Music Boosters? Click here to join! Solo and Ensemble Festival is coming soon. Jazz Ensemble will be performing for the annual Prairie State Jazz Festival on Thursday, 2/15/18. Parents are welcome to attend! ​6:30 pm and the concert will begin at 7:00. Click here to view the info letter. The Music Boosters are holding their annual Carsons Community Days coupon book fundraiser! Please help the Boosters to continue to support the band and chorus students. Click here for more info. The Richards Marching Night will take place Friday 10/6 (for 7/8th graders). Click here for details. Click here to view the note provided by Richards. The OLCHS Marching Night will take place Friday 9/15 (for 7/8th graders). Click here for details. Music Spirit Wear is available, and it looks awesome! WE NEED YOU to join the Music Boosters! Support the bands and choruses of OLHMS and the d123 Beginning Band! Click here for more details. Welcome back letters were given to the OLHMS band students the first week of school. ﻿﻿Click here﻿﻿ for the Intermediate Band (2nd year band )letter and click here for the Concert Band (3rd/4th year band) letter. We had our annual pool party at Centennial Pool and it was a blast! Thanks to the Music Boosters for the fun time! Save the date! 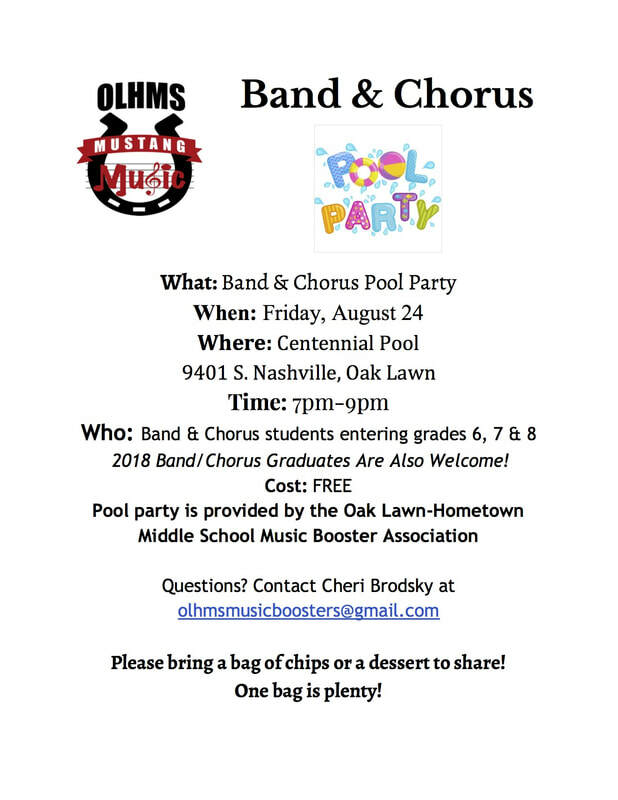 We will have a band pool party at Centennial Pool on Friday, August 25. Click here for more details. OLHMS Jazz Band Audition Music has been passed out. Visit the Jazz Band Page for more info. ILMEA Honor Band and Jazz Band music has been handed out to interested incoming 7-8th grade students. See Mr. Kehl or Mrs. Lyons for more details. Would you like to register your child for Beginning Band? First, read over the Beginning Band Page for info then contact Mr. Kehl or Mrs. Lyons.